Witnesses said Johnson's father was seen leaving HMP Moorland near Doncaster in the early hours. The car was later seen arriving at the former player's mansion near Hartlepool. He told Press Association Sport: "People leave prison every day and face difficulties with getting work. It's especially difficult for people convicted of sexual offences. "The media fascination with Adam Johnson says less about him and his crime and more about us as a society. Do we want people to be punished forever?" 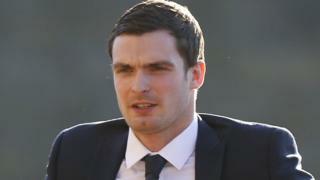 The FA said "appropriate safeguarding restrictions have been put in place" regarding Johnson. The victim, who cannot be named for legal reasons, was a Sunderland season ticket holder and was "infatuated" with Johnson.